Federer, who is fresh from the success at Swiss Indoors last week, will be eyeing his 100th career title in Paris Masters, which has a star-studded field even after the late withdrawal of top seed Rafael Nadal. Third seed Roger Federer has conceded he is not aiming "too high" at Paris Masters — the ongoing Masters 1000 tournament to which he has returned after a three-year absence. Federer has said he is feeling good after winning his 99th career title at Swiss Indoors ATP 250 tournament at his hometown — Basel last week. However, the 36-year-old insists he is not sure about his chances in Paris, considering the power-packed field. The 20-time Grand Slam champion, who had received a first-round bye, progressed to the third round after his opponent Milos Raonic withdrew, hours before their second-round match on Wednesday. Federer though has a rocky path to the final stages of the season's final Masters 1000 tournament, considering he has been drawn alongside the likes of soon-to-be world number one Novak Djokovic and seventh seed Kevin Anderson. Federer has one less threat as the top seed and world number one Rafael Nadal withdrew from the tournament before his second-round match on Wednesday, citing an abdominal injury. 'I do not know if I will able to win. Honestly, the path is very far. I know that every tournament that I play now is possible to win the 100th, but with the return of Rafa [Nadal], the presence of Djokovic and other strong players on hard, it is difficult," Federer told the ATP. "In addition, I found that I had a draw not easy, where I find myself facing large servers. We'll see everything after round. I have always wanted to leave the door open for Paris and I am happy to be here. I like playing here. 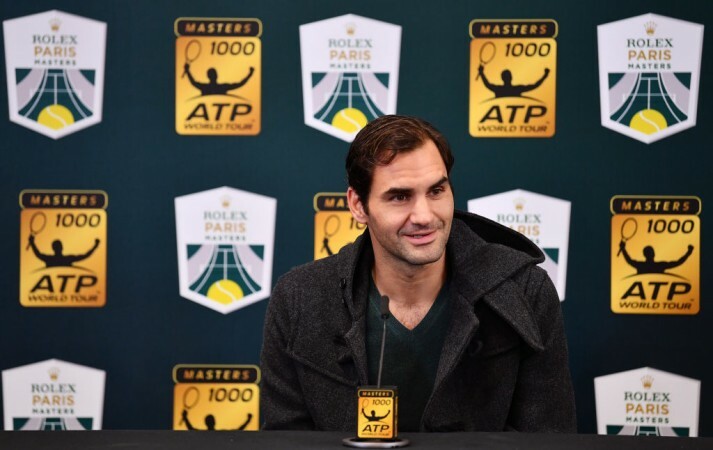 "'I'm very happy, I was very happy winning Basel - my home tournament. I love playing in front of my family, my friends, my kids - everybody was there so that was a very emotional victory for me. "Also, it was no. 99 so that's a very cool number. Of course, it helps me with confidence but I'm personally not aiming too high here in Paris." In Nadal's absence, Djokovic, who will be crowned world number one on Monday, starts as the overwhelming favourite. The Serb eased past Portugal's Joao Sousa with a straight-set win in the second round and is all set to face lower-ranked Damir Dzumhur in the third round on Thursday. Djokovic, who has been undefeated on hard court over the last 19 matches — a run that saw him win the second major title of the season at US Open — may face a tricky test against fifth seed Marin Cilic in the quarter-final. On the other hand, Federer will face 13th-seeded Italian Fabio Fognini in the third round before a possible match-up between the winner of a third-round match between Kei Nishikori and Anderson.